I have been using eGMAT for my Verbal and see that my CR percentile is way too below what is essentially required. I had got 6 out of 6 CR's correct and majorly lost the score because of poor timing that is yet to be improved through practice. I had only 2 mins for the last 9 questions!! In the GMAT Prep questions my CR ability is 75% but in eGMAT scholaranium my percentile was as low as even 2%, yes 2%!! to V38 within a month and my SC and RC is quite good. P.S: Kindly excuse if this is not the right place to post the question and help me direct it to the right place. You could try solving some (hard) official CR questions. Checking your accuracy there will give you a better idea about what you can expect on the exam. You shouldn't worry too much about your performance on non-official material if you can maintain reasonably high accuracy levels on those questions. You shouldn't focus too much on question difficulty either. 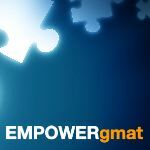 It's not as if the GMAT presents only the very toughest questions (at even the highest score levels). 2) What other study materials have you used so far? 5) When is your exact Test Date? I’m glad you reached out, and I’m happy to help. To improve in Critical Reasoning, your first goal is to fully master the individual Critical Reasoning topics: Strengthen the Argument, Weaken the Argument, Resolve the Paradox, etc. As you learn about each question type, do focused practice so you can track your skill in answering each type. If, for example, you get a weakening question wrong, ask yourself why. Did you make a careless mistake? Did you not recognize the specific question type? Were you doing too much analysis in your head? Did you skip over a keyword in an answer choice? You must thoroughly analyze your mistakes and seek to turn weaknesses into strengths by focusing on the question types you dread seeing and the questions you take a long time to answer correctly. Another major mistake that people make when training for CR is that they do practice questions too fast. To get Critical Reasoning questions correct, you have to see exactly what is going on in the passages and answer choices, and you likely won't learn to do so by spending a few minutes per question. At this stage of your training, you may need to spend up to fifteen minutes per question, learning to see what there is to see. Here is a way to look at this process: If you get a new job in a field in which you are not experienced, you may not be as fast as the other people working with you, but you know you have a job to do. So, what do you do? You do the job correctly, if not as quickly as those around you, and you make sure that you learn all the angles, so that you do the job well. Rushing through the job and doing it incorrectly would not make sense. As you gain more experience, you learn to do the same job more quickly. Think of Critical Reasoning questions similarly. Your job is to do what? To get through questions quickly? Not really. Your job is to get correct answers. So, first you have to learn to get correct answers, generally at least 10 to 15 in a row consistently, and more in a row would be better. Doing so is doing your job, and if it takes you fifteen minutes per question to get correct answers consistently, then so be it. Only after you have learned to get correct answers consistently should you work on speeding up. Remember, working quickly but not doing your job is useless. Better to work slowly and learn to do your job well. You can be sure that with experience, you will learn to speed up, and then you will still be doing your job well, i.e., getting correct answers consistently. Finally, a crucial aspect of getting correct answers to Critical Reasoning questions is noticing the key differences between trap choices and correct answers. Trap choices can sound temptingly correct, but they don't get the job done. The logic of what a trap choice says simply doesn't fit what the question is asking you to find. So, to find correct answers, learn to see the key differences between trap choices and correct answers.